Kyiv National University of Architecture and Construction in Ukraine hold a workshop within the framework of conference “Contemporary education”. It was organized by the team of KG’MGarchitects studio. The main topic of workshop was using Autodesk Maya software for the design of architectural objects. The first step served as a series of lectures designed to provide participants with tools (software), such as: modeling, the basics of direction of particles by the action of external forces and also the methods of simulation of physical processes in Maya. Lectures held by Iurii Kaygorodtsev, Tanya Zabavska, Andrew Mogylnyi and Kirill Tsuman. The principal aim was to acquire skills in using of digital methods to optimize the architectural spaces and structures. Examples were given by Frei Otto method of minimizing the ways (simulation sticking threads) and receiving of minimal surfaces (simulation of physics of materials). Frei Otto’s method was used in first task to identify the pattern of spots which are more free from flows of people. 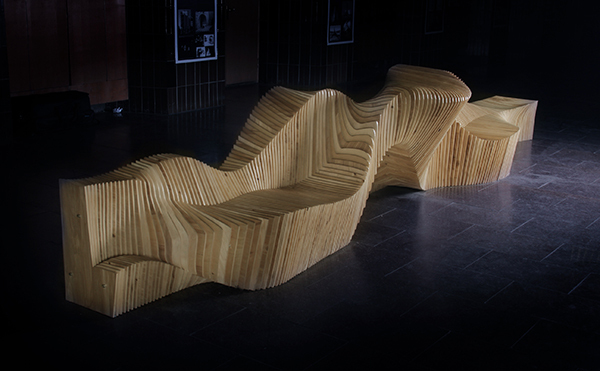 Participants were invited to use one of the chosen spots to situate their own version of the bench. 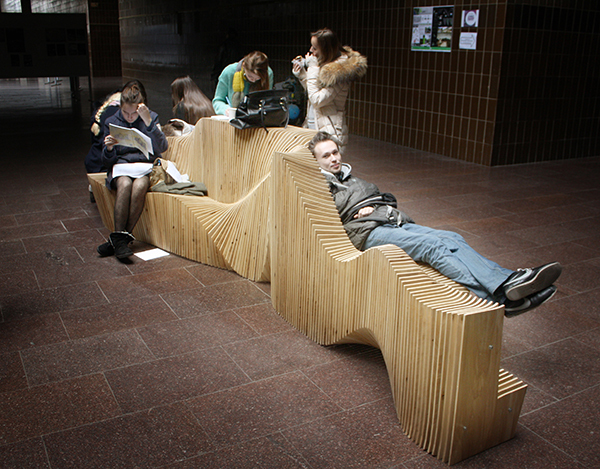 The project of multifunctional bench was designed by students of KNUCA Roman Sakh and Konstantin Kuchabskyi . 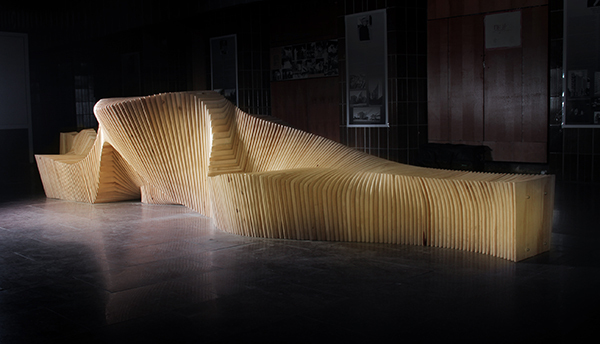 The main idea in the project was to create the object which includes a variety of different functions of the public space in the university hall. Starting points in modeling of the bench were different scenarios of using the object. The variety of chosen scenarios formed the basic of creation of geometrical sections of the object. Sequence of the sections made it possible to create a single volume subordinate (which depend to) fluid geometry. To streamline the production process there was chosen the method of splitting the object layer by layer. 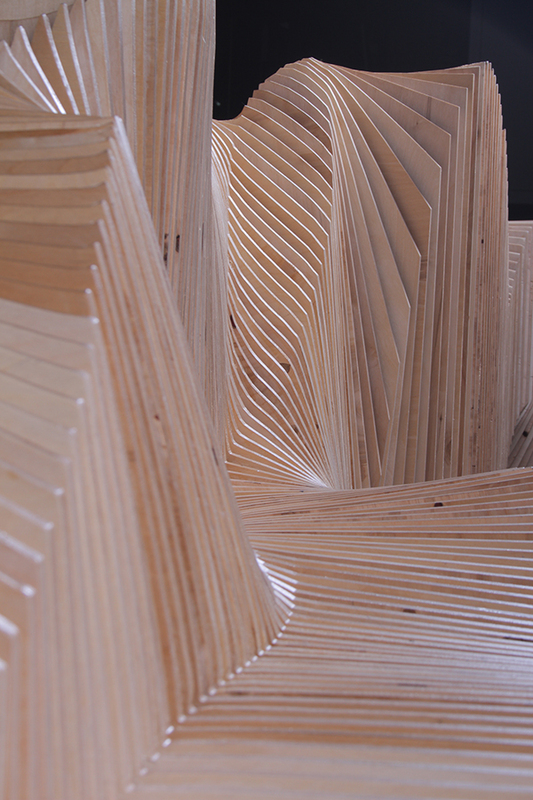 The segments were cut by CNC technology from plywood sheets by prepared vectors. Resulting elements are fastened together with thread rods which are uniformly distributed over the cross section segments of the bench to ensure its sustainability.